Out of action for almost a year and a half, Tim Spriggs will return in September to compete in the +99kg (218lb) division at the ADCC World Championship in Espoo, Finland. The Team Lloyd Irvin black belt takes the final invite in the division, which includes notable names such as 2015 champion Orlando Sanchez, past champs Roberto "Cyborg" Abreu, Vinny Magalhaes, and Jeff Monson, and of course Marcus "Buchecha" Almeida. 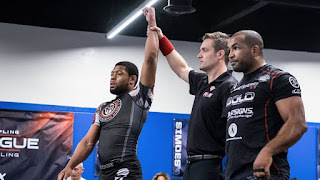 The 25-year-old Spriggs had considerable success as colored belt, but his main achievement was in 2015 when he was crowned Five No-Gi Super League champion, beating Yuri Simoes, Bruno Bastos, and Lucas Rocha in the same day. Spriggs dropped off the radar after 2016 Pans, and his absence drew questions from fans and industry insiders. The black belt took to Instagram a few weeks ago to explain that he had taken time out to reevaluate his perspective and rediscover his fire for competition. Spriggs joins TLI teammates DJ Jackson (-77kg) and Mahamed Aly (-99kg) among the entries at ADCC Worlds.